1.1 - The PROCESS TECHNOLOGY LTFH Series Filter Housing is designed for continuous filtering of high temperature, corrosive chemicals. The filter housing delivers superior field service life compared to typical fluoropolymer filter housings and eliminates the need to replace the housing when the element is replaced. filter housings. 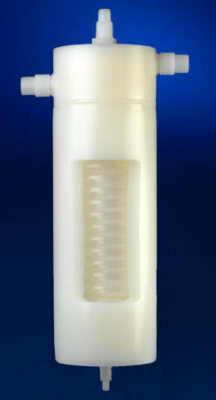 Eliminates the need to constantly replace the filter housing when the cartridge is replaced. Long service life: Reusable, thick wall housing is designed for extremely long life in the most demanding chemical applications. Outstanding chemical compatibility: 100% fluoropolymer (PTFE) wetted parts compatible with virtually all chemistries. HIGH OVERALL HEAT TRANSFER: Enhanced turbulence with low pressure drops Wetted surface area 5 to 6 times that of equivalent tubular designs. 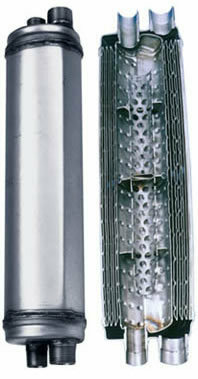 Heat transfer rates 3 to 4 times that of tubular heat exchangers. INNOVATIVE DESIGN: TherMax2 Spiral Plate Inline Heat Exchangers feature a cylindrical dimpled plate design wound into a self-enclosed spiral provides extremely high thermal transfer for package size. Patented fabrication process ensures consistent, high quality production. ALL WELDED CONSTRUCTION: No gaskets to fail. TIG welding is used on the sheet edge (which separates Circuit A from Circuit B). LOW INTERNAL VOLUME: Maximum single circuit capacity 76 fluid ounces (2.2 liters). COMPACT MODULAR DESIGN: Offers easy installation and servicing. Manifolding is simplified for larger applications. Heat loss is low, requiring little or no insulation. CHEMICAL COMPATIBILITY: Chemistries compatible with 316L and silicon baffles (B circuit only). MAXIMIZED HEAT TRANSFER SURFACE: Dimpled sheet provides sheet spacing localized turbulence. Results in very high heat transfer rates. APPLICATIONS: Industrial, process system, cogeneration, solar, plating, electronics, commercial & industrial washers, evaporators/condensers, chillers, heat recovery, boilers (steam and water), vapor recovery, and water heaters. SIZES: Seven sizes from 1.1 ft2 (.10 m2) to 15 ft2 (1.4 m2). Compact cylinders from 3” (70mm) x 6” (158mm) to 5” (120mm) x 20” (515mm). • Exceptionally clean performance: Chemical heat exchanger is cleanroom assembled and tested to ensure the highest manufacturing standards. • Leak free operation: Integral inlet/outlet for single point fluid connections simplifies installation and greatly reduces the potential for chemical leaks. • Outstanding performance: Heavy wall, large diameter tubing improves circulation and minimizes pressure drop. 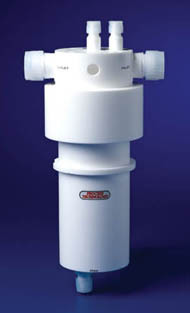 • Compact size: Less surface area required for same BTU exchange compared to most other fluoropolymer exchangers. • Rugged construction: Thick wall, welded construction provides extremely long service life. • Outstanding chemical compatibility: All tube-side parts are fluoropolymer and compatible with most chemistries for virtually unlimited process options. Shell is available in polypropylene (standard) or PVDF construction. Service: In-line chemical heat exchanger with all fluoropolymer wetted surfaces (tubing side) for virtually any wet chemistry application.